FREE Rent Statistics made for Tenants by the Tenants' Union. 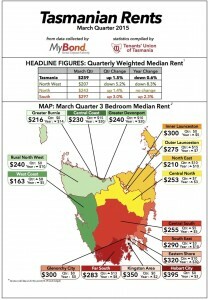 Welcome to the latest issue of Tasmanian Rents. Every quarter the Tenants’ Union publishes rent statistics compiled from Bond Lodgement Forms collected by the Rental Deposit Authority. The data is based on information provided by both the landlord and tenant when lodging a bond with the Rental Deposit Authority. This issue includes statistics from the fourth quarter of 2018 and the 2018 calendar year as a whole. We compare the weighted median rents of Tasmania’s three geographical regions, which are rents that comprise all property sizes, with their equivalents from the previous quarter and the same quarter of the previous year. In more detailed overviews, you will find median rents for different property sizes (1 bedroom, 2 bedroom etc) in particular regional areas and their change since 2017. Rents rose in all three regions in the last quarter, with the North (Launceston & the North East) region experiencing the greatest increase at 4.5%. Rents in North West increased by 2.8%, while the South has an increase of 3.5%. Because of anomalies associated with calculations of medians, the statewide increase was 2.2%, a figure below any of the three regions that are combined to make the statewide figure. Rents rose in all three regions, across nearly all dwelling sizes in 2018, with the only falls being in the 1 bedroom category in the North and North West. The rent for 3 bedroom properties in the South rose by 8.6% in 2018, following on from a 7.7% increase in 2017. Three bedroom rents in the South are $80 higher than in the North, which are in turn $30 dearer than the North West. The Rental Deposit Authority and Tenants’ Union of Tasmania give no warranty regarding the data’s accuracy, completeness, currency or suitability for any particular purpose; and do not accept liability howsoever arising, including but not limited to negligence for any loss resulting from the use of or reliance upon the data.